I'm not sure if it's just me or if it is a global phenomenon, but there seem to be a plethora of games around these days with some sort of funky controller. In truth the gaming wheel has been around for a very long time and so probably doesn't deserved to be lumped in with the drum kits, guitars, microphones, plastic tennis racquets, cameras, magic wands and all manner of wizardry as "the future current trend of gaming". But the prevalence, price and and social acceptance of these things has certainly allowed them to breed in my lounge of late. At any rate, I justified it on the grounds that I would no longer be able to do much fun driving in the real world once my first baby arrives in a couple of months, and that a combination of Gran Turismo 5 and a decent force feedback wheel would serve as suitable therapy. Plus, when I crash in Gran Turismo I won't be faced with the horrors of infuriating conversations with insurance company bods (like I unfortunately am at the moment). So what's it like? Part of me was skeptical, but I'm actually expecting it to keep me interested in GT5 for quite a while. It really does totally change the experience of the game. 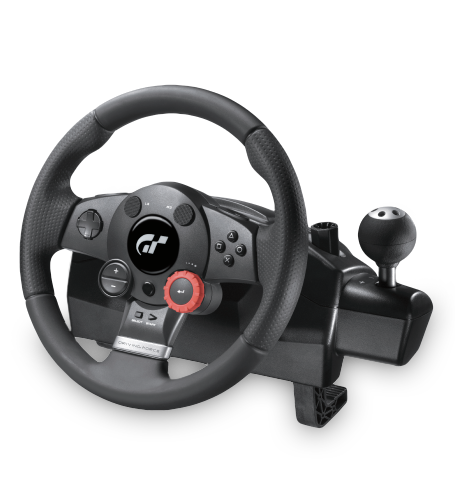 At first I found the whir and dynamic resistance of the wheel a little bit distracting, but I get the impression the GT5 game designers spent a long time getting things working well with it. It is actually pretty realistic, or at least has the right properties to give you a more involved experience. I hesitate to use the word "realistic" here as the dynamic tension effect does have a ratchet-like movement that took me a while to get used to, but I can't notice it any more. The truth is that the wheel does a remarkably good job of transmitting the feeling of reaching the limit of grip, and struggling with applying full lock in tight turns. My only slight niggles are that you can't use the gear lever to reverse (which says more about my propensity for crashing than it does about the wheel), and that the USB cable isn't quite long enough for me to use it on the sofa without an extension (the USB cable is about 4m I think). But it's well built, and overall lives up to its promise in my eyes.